Ever get a sunburn? Prefer to avoid them in the future? Mr. Burns combines information about your skin type and any sunscreen you're wearing with a realtime UV light measurement to let you know before the burn sets it! Ultraviolet Radiation. UVA (315-400nm) is the main culprit, and it can vary widely throughout the day, geography, time of year, etc. Initially, I went to the usual sources to get a UV sensor, but I found out they were very expensive ($20 - $30). If you take a regular LED and invert it (so the anode is connected to ground), it will generate a very weak voltage in response to light, but you need an op-amp circuit to amplify the voltage & I wanted something simpler. Finally, I came across this whitepaper from Mitsubishi - they had the problem of sensing when to turn on the light in your remote control; a capacitive sensor would turn it on when it's not needed and waste power. They figured out a way to sense light using the backlight LED itself - and that's what Mr. Burns is based on. Once Mr. Burns has skin tone, UV level, and sunscreen info, it uses WHO data (pdf) to determine how long until you get a sunburn. Here's a walkthrough of how it works. Note that I'm using a Propeller Platform SD and LCD UI module, but this instructable will also show you how to do it on a breadboard. Most people don't put on enough sunscreen - you're supposed to put on 1mg/cm2, which means about an ounce to cover an adult male. You're also supposed to re-apply every 2 hours. If you do this correctly, you're fine, but otherwise, you should under-estimate the SPF of your sunscreen. Also, Mr. Burns measures incident UVA at the beginning of the exposure, but it doesn't re-adjust if UV changes. The literature isn't clear as to whether your skin is equally sensitive throughout the exposure. It's easy to implement, though - and if I find evidence that it is, I'll update the code. It's a Parallax Propeller running at 80Mhz connected to an HD44780 8x2 character LCD (4-bit interface). The Propeller stores the exposure table in RAM and measures incident UV through an R/C decay circuit. I built mine with a Propeller Platform SD and an LCD UI module. If you've got those, then the only thing you'll need is blue LED and 22pF Cap. Download the file on step 9 to your SD card, attach the LED & Cap, and you're ready to go. Here's the sourcecode. Everything is available under the MIT license. Breadboard and a bunch of hookup wire. First, review the schematic below to understand how everything is connected. The box on the left is the SD card slot, and the box on top is the Prop Plug. I'll walk through breadboarding it, but the schematic is your best guide. Here's a hi-res version, the lo-res version is below. Add the voltage regulator and bypass caps as shown on the image below. Also, add the battery box, connecting the black wire to the negative rail, and the red wire to the input on the regulator. I've also added pull up resistors in the picture, that's for the EEPROM I'll add in the next step. Add the EEPROM, connecting Vdd and Vss. Also add a 4pin header as shown in the photo. Connect the display - it's quite a few wires, so follow the schematic. Note that I'm using a protoboard to make the display hookup a bit easier. I suggest you do the same. The crystal goes on the pins marked Xo and Xi. No need for caps on the crystal. If you edit the code, you can get away with less, although it's nice to have the additional inputs. I've breadboarded 2 buttons below. Also add the LED and cap. This is your UV sensor portion of the circuit. The longer lead on the LED goes to the negative rail, the shorter lead connects to P7. Once you've got everything wired up, download the sourcecode (here), connect your Prop Plug and program the Propeller. 1 - The Propeller Platform SD is pre-assembled. 2 - Follow this instructable to put together the LCD UI. 3 - You don't need a Prop Plug. The Propeller Platform SD has a bootloader, so you just unzip this file and copy to the root of your SD Card. 4 - You'll need to add a blue LED and a 22pf Cap. You can get the Blue LED right here, the battery pack is here. The long lead from the LED goes to ground, the short lead goes through the hole marked P7. Connect the cap on the other side of the board to the same holes - doesn't matter which lead goes to which hole. That's it! Stay out of the sun! I think if you can turn this into a smaller package (using different microcontroller packages for example and a smaller LCD), you could sell these quite well during summer time. I mean I'm not into sun bathing related items and stuff, but i think this thing could be the next best invention to that field since sunscreen. If you can, assuming you have mass purchases, injectionmolding and a factory at your disposal, design one that is not bigger than those odometers which are cheap enough to be put into cereal boxes which come complete with LCD, for about 2 USD production price maximum, the lower the better, then this thing might have a bright future ahead. In Australia, I have my own sunburn alarm: IF Outside = 1 AND Visibility = 1 AND NaturalLight = 1 THEN AlarmState$ = "PANIC!" just when you have a bath, get a scour sponge and scrub your self. Ha! I think in Australia it's safe to assume that UV is always at 10. But the challenge with UV is that the level can change independent of visible light. For example, UV penetrates cloud cover, so even if it looks cloudy and shady, you may still be getting a lot of UV. Cloudy = NaturalLight, IF Visibility = 1 AND NaturalLight = 0 THEN Time = "Night" That means it's safe to spread one's wings and go for a night flight in search of food. A tan provides about the same protection as an SPF 4 sunscreen. Also, a tan doesn't protect your eyes, which are damaged from sun exposure. Wearing an SPF 40 sunscreen is a much better idea, just be sure to re-apply and use enough (about 1 ounce). Good project, but the only problem that I can see is that if you leave an LCD display in the sun for long periods it goes all black and can't be read anymore. 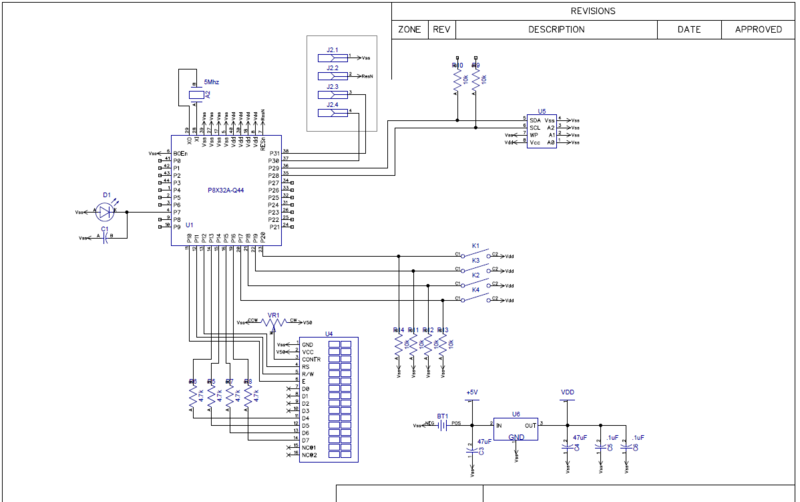 The schematic isn't a physical representation of the chip - the pins could go anywhere. You might notice the actual pin numbers next to each pin on the chip. You'll often see designers put all the Vdd or Vss pins next to each other. How about america stops being lazy and just wears sunscreen!!!! Could you use a pocket-calculator sized solar panel to power it? Seems like a pretty logical tweak. This is nice. I may make a waterproof one for the pool.